So, at first glance, you may be looking at this and wondering why it qualifies as a Sunday Supper, a category I've so far reserved for longer, time consuming recipes with multiple parts and ingredients. 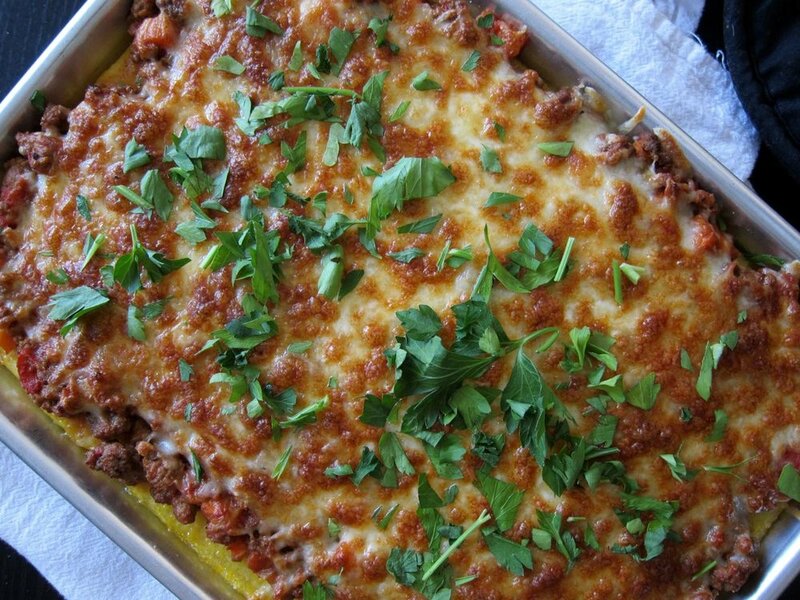 And you might see that I've layered baked polenta with meat sauce and cheese and then baked it, and think, "That's it?" Or, maybe you are just blindly following whatever I say and not questioning, or just skimming the words here and only looking at the pictures. In that case, carry on. But, if you are wondering, let me forewarn you that yes, this is a long, drawn out recipe, only because a true bolognese sauce takes a few hours at minimum, and you absolutely should take the time at least once in your life to make it from scratch. If you do skip that step and crack open a jar of Prego, well, then this easily qualifies as a weeknight meal. But then let me also keep going with this and let you know that most bolognese recipes I've encountered make enough sauce to feed an Italian army of approximately 30 adults, so you will undoubtedly have enough leftovers to freeze and then reheat if you're ever like, yeah, polenta pizza sounds awesome! I made half a recipe's worth of the bolognese I chose, and it still took up an entire large pot. It may take hours but you are well-rewarded in quantity, I assure you. 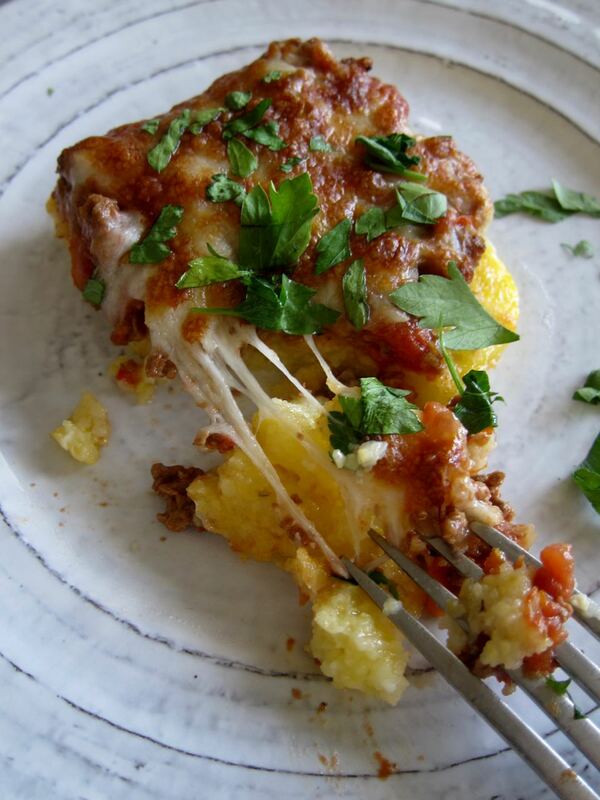 Ok, all justifications out of the way, this "pizza" of polenta piled with bolognese and cheese and then baked, is like the perfect pizza/casserole/baked pasta hybrid, with a crispy lid of cheese atop a molten sauce of ground meat and tomatoes, on a base of flavorful, creamy, crisp-edged polenta. It is filling and delicious and a perfect, cozy way to end a weekend. Make bolognese. Be sure to allow several hours for most recipes. Grease a quarter sheet pan with 1 tbs olive oil and set aside. In a large pot, bring water to a boil and add a glug of olive oil. Whisk in the salt and polenta. Lower heat to low and whisk for 2-3 minutes. Cover, and stirring every 10 minutes or so, cook polenta until creamy, 30 minutes. Remove polenta from the heat and stir in 1/4 cup parmesan. 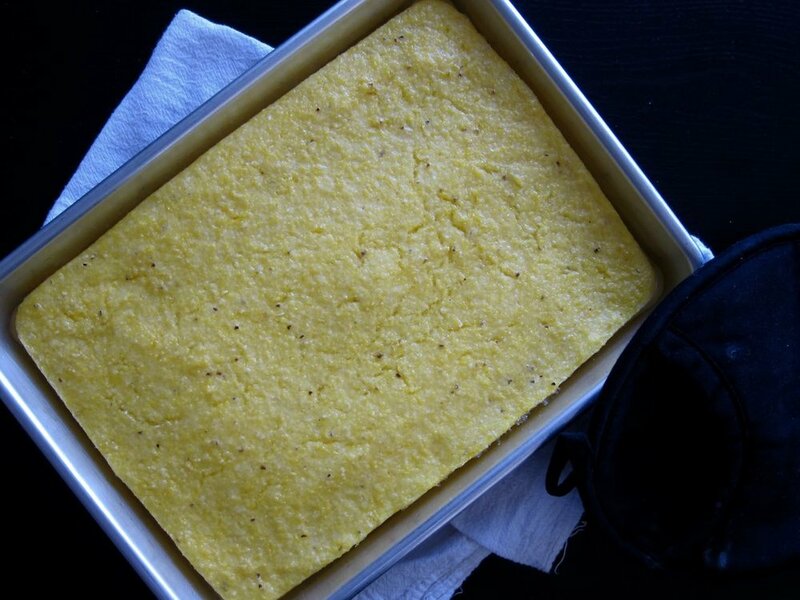 Spread polenta into the prepared pan and smooth into an even layer. Let cool completely, then cover and chill 1 hour or overnight. When ready to make pizza, heat oven to 450 degrees. Brush the polenta with 1/2 tbs olive oil. Bake for 15-20 minutes, until crisp around the edges. Top with bolognese and then cheese and bake until cheese is melted and bubbling, and starts to form a bit of a crispy lid. Let sit for a few minutes, then garnish with parsley and serve.